A Massachusetts man died in Carthage in western Maine on Sunday afternoon after an ATV he was riding struck a tree, according to state officials. Maine Warden Service photo. 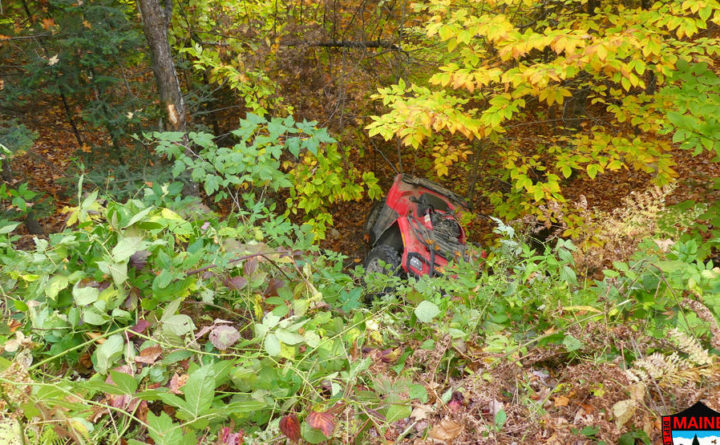 A Massachusetts man was killed in an ATV crash Sunday afternoon in Carthage, according to the Maine Department of Inland Fisheries and Wildlife. Game Wardens said 27 year-old Taylor Curtin of Belchertown, Massachusetts, had been camping with friends at the Rocky Mountain Terrain Park located off Winter Hill Road when the crash occurred. According to investigators, Curtin had borrowed a friend’s 2007 Can AM 800 ATV and was returning to the campsite when the ATV went airborne and struck a tree at about 1:30 p.m.
Wardens said Curtin was not wearing a helmet and they believe speed was a factor in the crash. Curtin was pronounced dead at the scene by EMS and was later taken to Farmington for examination by the state medical examiner’s office.